Always coming up with brighter ideas and fresher design, BMW is still at the forefront of vehicle enterprise. Currently in the limelight is the new BMW 330e; a car that has the latest hybrid technology and is one of the most efficient cars in its class. What makes the new BMW 3 Series Hybrid so special is that you can have the hybrid technology and still be able to connect with BMW’s ability to produce cars that are fun to drive. BMW tell us that the new BMW 330e sedan has the fuel consumption of a small car. You can have an electric driving range of up to 37 km thanks to the high-voltage battery which is stored underneath the luggage compartment. Yes, this does have an effect on the luggage carrying space but not as greatly as you might first consider. Boot space is still a useful 370 litres, which is more than enough for most day-to-day requirements. The trade-off is worth it though, with fuel savings guaranteed. If your drive does consist of a lot of urban driving, then the BMW 330e sedan is impressive. When driving in the city, the BMW 330e sedan covers short distances in the fully electric mode. In this mode, you can have a combined fuel consumption figure as low 2.1 litres/100 km, with CO2 emissions of 49 g/km. Add a little more commuting into the mix, and fuel consumption can still be as low as 4.0 litres/100 km. This is a whole lot lower than similar cars in the same class. If most of your drive will be out on the open road, then the BMW 330e sedan boasts around 7.0 litres/100 km under normal driving conditions. But will the BMW performance side of the new 330e ever feel comparable with what we’ve come to expect from this premium brand? You bet; it may be a hybrid but it still has the x-factor for dynamic road-holding and plenty of sparkling power. It wouldn’t be a BMW if it didn’t perform to our expectations. The combined petrol and electric motor can put out as much as 185 kW, while a peak torque of 420 Nm is achievable. The 330e uses a turbocharged 2.0-litre petrol engine along with an eight-speed automatic gearbox to put the power down at the rear wheels. Mounted within the gearbox, and also driving the rear wheels, is an 65 kW electric motor, which takes its power from a 7.6 kWh lithium-ion battery located under the 30 mm higher boot floor. Top speed is a swift 225 km/h, while acceleration from standstill to 100 km/h can be completed in less than seven seconds. That’s quite quick, actually. BMW refinement is good – as the ride, though firm, soaks up road bumps well. Sitting lovely and balanced on the road, the car feels safe and quiet at speed. Brakes are nice and strong, while having modern regenerative power technology. 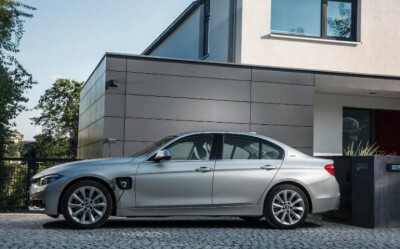 In full electric mode the 330e will travel up to 100 km/h before requiring the aid of the petrol driven motor. So what you get is a very quiet ride. Limiting the battery to 7.6 kWh also means it’s relatively quick to charge. You can charge the battery at home or at any charging station. 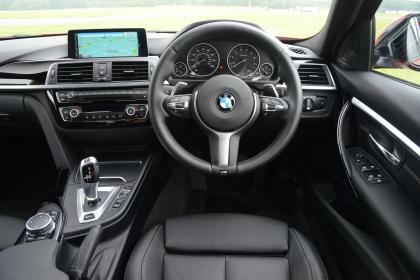 Inside the new BMW 330e is a world of comfort, modern technology and style. It is like any other of the impressive new 3 Series sedans inside, and you get a leather steering wheel, gear knob, seats and fascia inserts. You’ll be right up there with the best of them, as the new BMW 330e has comfortable seats for five – though four suits it best. Some noteworthy improvements (or advancements) for the 2016 3 Series sedan is the subtle update to the car’s exterior styling and interior trim enhancements. There are some tweaks that have gone on in the suspension and steering department that BMW claims has improved handling precision. For those who, like me, enjoy music when on the move, the new 3 Series comes with a 16-speaker sound system. LED headlights are now available, as are automatic remote updates for the navigation system and a new Track Handling package that replaces the Dynamic Handling package. M Sport trim is also available for the 330e. One of the coolest features is the BMW Remote App for iOS and Android systems where a detailed display of information about the vehicle’s current status, such as its location, battery level and remaining range is available to the driver. Also, the charging procedure can be controlled remotely via the week-to-view timer, and the vehicle’s temperature can be remotely adjusted in good time so as you can settle into a nice temperate cabin – great for cold mornings! Destinations, points of interest and the location of charging stations can be easily sent from the application directly to the vehicle to make your next journey even more informative for you and other occupants. This is a very smooth, comfortable sedan; and the BMW 330e is one of the best current hybrid drives, as it’s fun to drive as well as frugal. For any more information on the new BMW 330e or, for that matter, any other new car, contact one of our friendly consultants on 1300 303 181. If you’d like some fleet discount pricing (yes even for private buyers! ), we can submit vehicle quote requests out to our national network of BMW dealers and come back with pricing within 24 hours. Private Fleet – car buying made easy!